I have inherited my share of back pain issues from both my mother and grandmother. I’ve watched them struggle with their pain, and struggle more with the medications that are prescribed as treatment. Thankfully, medications are not the only remedy for back issues. Here you will learn about some of the great, all natural remedies for back pain relief. Options such as massage treatments, essential oil and supplements are a great alternative to medication. Some of these I have used personally and found them to be far superior to medication. And your back, and legs and well all of it. Exercise is one of the most powerful natural remedies that we have. People continue to sit on their butts. Even the CDC has warned us about how a sedentary lifestyle can lead to all kinds of chronic disease. (2) Exercising to combat your back pain does not need to be strenuous. Take a walk, take a swim, ride a bike, play catch with your dog, just start moving. This is one natural remedy for back pain which has several bonuses. You will likely shed a few pounds in the process, your mood will be elevated as exercise releases feel-good Endorphins into your system, and the increase of cardiovascular activity can decrease your blood pressure. There is no reason not to be exercising regularly. Peppermint oil acts as a natural analgesic. This means that the compounds in peppermint oil can cool inflammation. In a recent study, it was shown that peppermint oil was an effective treatment plan for joint inflammation experienced by those with fibromyalgia. Because back pain is commonly a result of inflammation, peppermint oil is a great essential oil to start your fight against back pain. (3) In addition to helping out with achy joints and muscles, peppermint essential oil also has an almost immediate effect on your mood and decrease stress. Because stress is often related to back pain, any type of stress reduction will help your all-natural approach to back pain. We know a good back rub can make everything better, right? Well, there is now scientific proof that regularly scheduled, professional massage therapy can have as powerful an effect on chronic back pain as back surgery. (4) Although some folks are turned off by the “temporary” relief you get from massage therapy, if you think about it the relief you get from prescription meds is temporary as well. That’s why you have to keep getting your prescription filled. If you are looking for non-drug, all natural treatments, this is a great option. Before you start thinking that you need to spend a fortune to reap the benefits of massage therapy, just log into YouTube. That’s right there are tons of great how-to massage videos featuring professional massage therapists. If you have a friend, partner or family member who is willing to watch a few of these videos to get down some techniques, you can quickly conduct your massage therapy at home for free. For a potent topical application try this recipe. Stress is a huge contributing factor to back pain. When we are stressed, our muscles tighten up, causing spasms. These spasms can last a few minutes to a few days. Lavender oil was recently used in a clinical trial conducted by the International Journal of Psychiatry in Clinical Practice. During this study, it was discovered that the relaxing properties of lavender could have better results than many anti-anxiety medications and anti-depressants. (7) In this research, lavender oil was given orally in capsule form. Patients in the studies saw a significant reduction in their levels of anxiety and stress. Figuring out sustainable ways to manage your stress can have a significant impact on your back pain issues. In addition to relieving back pain causing stress, lavender oil is also renowned as a sleep aid. Restful sleep works hand in hand with all of your body systems to keep you balanced and pain-free. Black pepper has strong warming, anti-inflammatory as well as anti-spasmodic properties which makes it a perfect addition to your all-natural back pain arsenal. Black pepper essential oil can be combined with fractionated coconut oil in a ratio of 1-2 drops black pepper oil with 1 tablespoon of coconut oil and then be used topically applied right to the painful area. Eucalyptus essential oil has dozens of uses and benefits, but we are concerned with back pain. So do the Koalas know something we don’t know. Yeah, they do. A study conducted by the South Korean University used Eucalyptus oil on 52 patients who had recently undergone knee replacement surgery. (11) These patients showed a significant reduction in pain levels. More closely related to back pain issues, however, was another test conducted with arthritis patients. These patients only used Eucalyptus oil in an aromatherapy context and saw great results with pain management as well as depression symptoms stemming from pain issues. Many back pain issues are similar to arthritis issues, and many back pain suffers have undiagnosed arthritis. For significant pain relief, Eucalyptus oil was dabbed on a pad and inhaled for thirty minutes a day. As a working mom, there is a lot of stress-related back pain in my life. Compound that with a good dose of inherited arthritic pain, thanks grandma, and I have had my share of sleepless nights, tossing and turning in pain. I have a huge aversion to prescription medications, especially pain relievers. I recovered from a C-section with nothing more than Advil. So, needless to say, addressing my chronic, stress-related back pain with doctor prescribed painkillers was not an option for me. However, I started turning to over the counter options such as Sodium Naproxen. Unfortunately this seemingly harmless over the counter remedy has its own slew of nasty side effects, including stomach irritation that had me suffering acid reflux almost nightly and water retention that had me weighing in 5-6 pounds heavier almost overnight. I turned to lavender oil in hopes of alleviating my stress levels and increasing restful sleep. Once I had my stress levels under control, I was able to address my arthritic pain with Turmeric, which after 3 weeks of getting into my system worked better than Advil or Sodium Naproxen. I did notice, however, that once you have started therapeutic doses of Turmeric, you must take the does consistently. The levels in your body can drop quickly, and you will then lose the pain management effects rapidly as well. Below I’ll share a few of my favorite ways to use natural back pain relievers. A roll-on of proprietary blend essential oils, specially formulated to combat back pain, can be a perfect, convenient way to stay on top of your pain issues. There are many roll-on essential oil options. Some are single oil options while others are blended options. 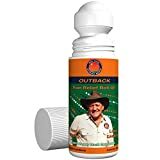 Outback Pain Relief Roll-On is a great, portable blend of some powerful pain relieving essential oils. Tea Tree Oil, Vanilla, Blue Malle Eucalyptus, and Olive Oil are combined in perfect harmony to bring natural pain relief. The essential oils listed above can be combined with other types of all natural ingredients to create the perfect pain fighting combination. Glucosamine with Chondroitin Turmeric MSM Boswellia is a powerfully blended, oral supplement which combines the joint nurturing aspects of Glucosamine and Turmeric with the strong pain-relieving compounds of Frankincense. This supplement is taken orally. Homeopathic pain relief creams infused with herbal compounds are also beneficial when it comes to natural pain management. Herbs such as Arnica have strong pain fighting properties. 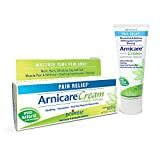 This herb has been formulated into a pain relieving cream in Boiron Arnica Cream for Pain Relief. When I first learned that there were natural ways to fight my pain, I was so excited. After watching my mother and grandmother deal with the side effects of painkillers, I knew I did not want to go down that path. I hope that by sharing this knowledge and my own stories, you will choose a more natural way for your back pain relief as well. Please know, this is not an exhaustive list by any means, but rather a starting point. Conduct your research, try different approaches to see what will work best for you and your particular symptoms. Remember, everything we need to heal our bodies and live our best life is in the earth. Tapping into that healing power takes a little research, creativity and patience.